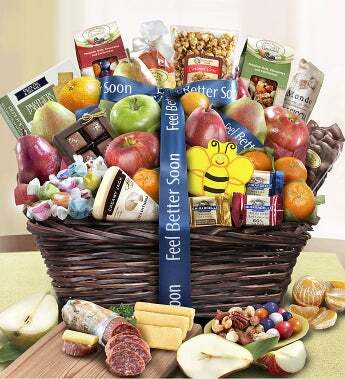 They are sure to feel better soon when you show how much you care by sending this impressive taste sensation. This handsome walnut stained wicker & rope basket is fabric lined, tied with a Feel Better ribbon and filled with fresh fruit, nuts, snacks, chocolate and other candies. It's a delicious way to brighten their day!! They are sure to feel better soon when you show how much you care by sending this impressive taste sensation. This handsome walnut stained wicker & rope basket is fabric lined, tied with a Feel Better ribbon and filled with fresh fruit, nuts, snacks chocolate and other candies. It's a delicious way to brighten their day!